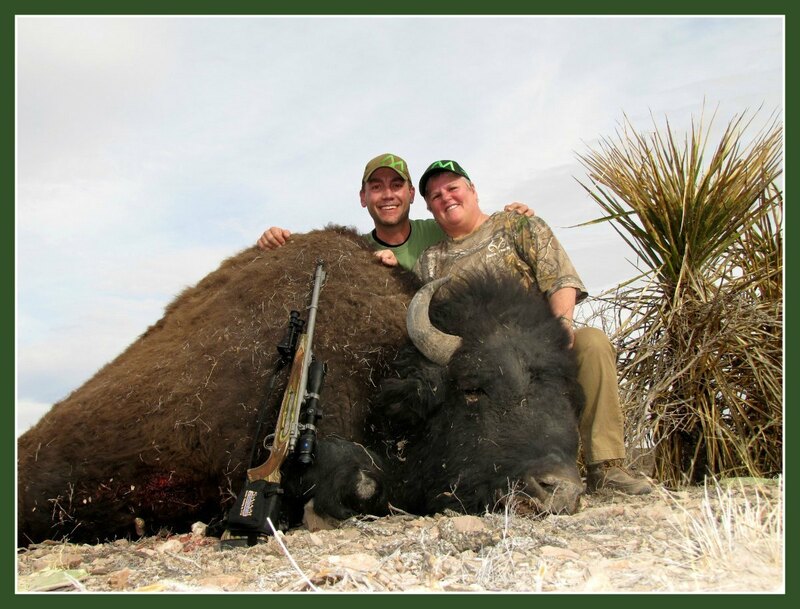 Book your Buffalo Hunt here! Congrats on a great buffalo, Margaret! It’s always a blast hunting with you…literally! Most people don’t realize that there are free range buffalo, or American Bison, in Texas, but West Texas has some of the biggest buffalo bulls I’ve ever seen. My trophy free range buffalo are huge and typically tip the scales at well over 2000 pounds! These are typically old solitary bulls that are no longer part of the herd, or they are the herd bull. When we go on a buffalo hunt, we typically drive around until we locate the bulls and then we get out of the vehicle and the stalk begins. With sparse vegetation, no natural predators, and the size of these bulls it’s not that difficult to locate them, but it can be quite a challenge to get close enough for a shout while remaining at a safe distance. Despite their size, these bulls are extremely quick and agile and you’ve got to be careful on these hunts. .30 caliber rifles, or larger, are recommended on these hunts! I’m on every Buffalo Hunt to provide my personal attention/service to your hunt to help ensure your hunt is an experience of a lifetime. Because of the size of these animals, and the amount of work involved once you harvest your buffalo, it’s best to only hunt one of these animals at a time. 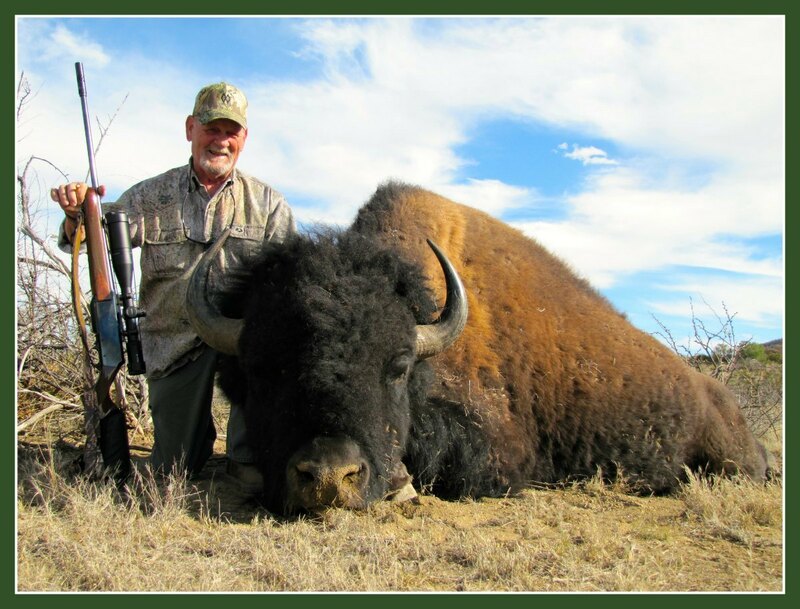 2 hunters would be the most I would want to take at one time and we would need to allow 4-5 days, only harvesting 1 buffalo a day, to give us enough time to care for each buffalo properly. Experienced bowhunters are also welcome. Buffalo, or American bison, stand 5-6.5′ tall and mature bulls frequently weigh over a ton. Both buffalo bulls and cows have curved, sharp horns that may grow up to 2′ in length on mature bulls. Their average lifespan is 12-20 years. When necessary, buffalo can run 40 mph. Buffalo are grazers and feed on grasses, herbs, shrubs and twigs and regurgitate their food, and chew it as cud, before final digestion. Buffalo are considered an exotic in Texas, and can be hunted year around, but because of their size, and thick, shaggy coat, it’s best to hunt them in the colder months from December through February. Because of their size, they have no natural predators and with the sparse vegetation in West Texas it’s typically not all that difficult to locate them. The trick is to get close enough for a shot, but to remain at a safe distance. With buffalo being considered an exotic in Texas you can hunt them year around, but it’s best to hunt these free range buffalo in the colder months from December through February. I typically wear a comfortable pair of boots, jeans and some depending on the temperature I’ll wear a wool T-shirt adding long sleeves and a jacket/coat in cooler weather. When it gets real cold I’ll wear insulated overalls and a big insulated coat. 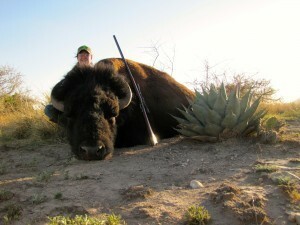 The only region in Texas that has free range buffalo, that you can hunt, is West Texas. There are numerous game ranches in the Texas Hill Country that have buffalo that you can hunt, and even a herd in Caprock Canyons State Park, but if you want to hunt free range buffalo in Texas you’ve got to go to West Texas. 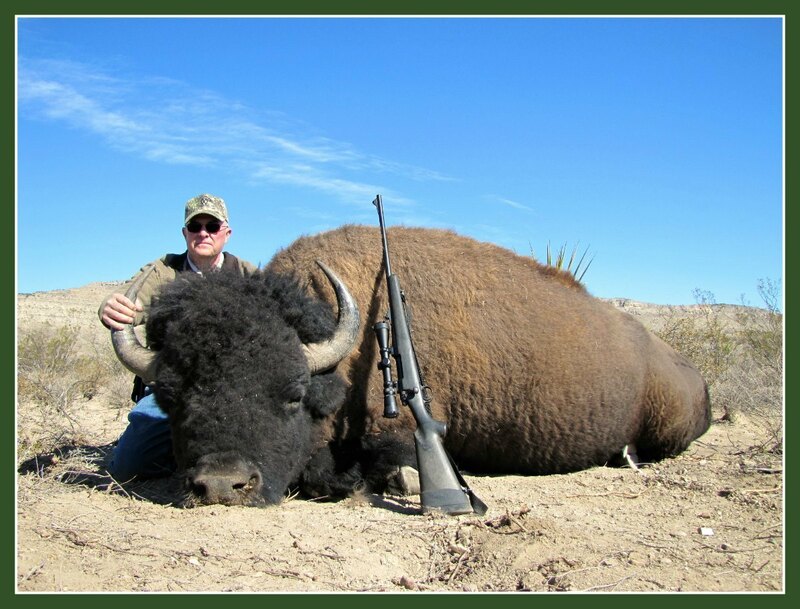 If you would like to read my blog posts about some of my previous Buffalo Hunts, click here.